Y’all, I am obsessed with kale chips. I am not afraid to admit it, and I know I am not alone. On a whim a couple of weeks ago, I toasted some almonds and seasoned ’em up with a little salt and sugar, mixed them with the kale chips, and called it snack mix. It was delicious, but I knew it could get better. So I worked on the nut seasoning, and I think I nailed it. I enjoy these almonds alone, or tossed with kale chips. 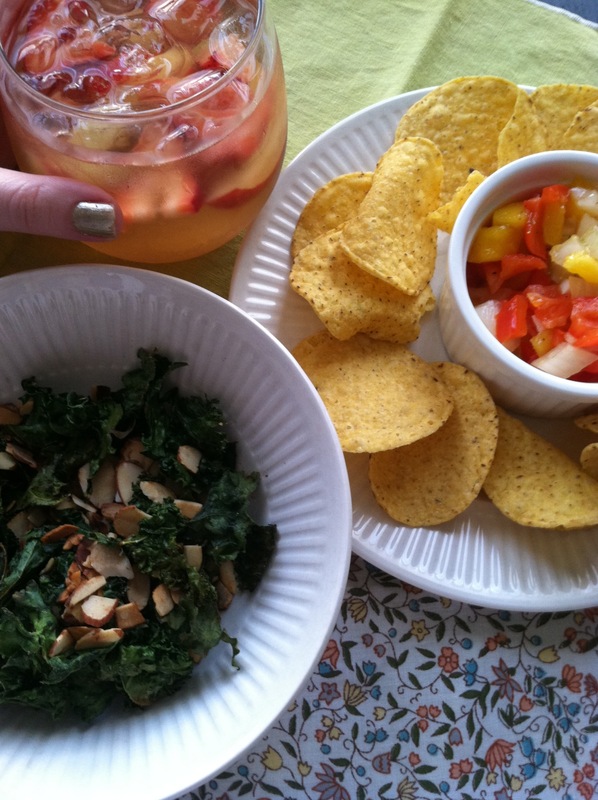 I’ve plowed through bowls of this Almond-Kale mix while watching the NBA Finals, or a good Rom-Com, it is the crunch of popcorn combined with a sweet, salty, spicy flavor punch, and minus any of the empty calories. If you don’t have garlic infused olive oil, you can quick infuse some in a skillet over low heat with a 3 cloves of garlic. Just warm the oil, and let the warm oil steep with the garlic for a few minutes. If you don’t wanna do that, then just substitute melted butter for the garlic oil, slightly less healthful, but oh, yummmm….. Combine salt, spices, and oil in a large bowl, and set aside. In a heavy bottomed skillet, spread the almonds in a single layer. Toast over medium-high heat, swirling every thirty seconds until the almonds warm and just begin to brown (about 3-5 minutes). As soon as you see the nuts beginning to take on a golden color, add the nuts to spice mix and toss to coat. Allow to cool for a 3-5 minutes before chowing down.